Although the return of Strikeforce’s Heavyweight Grand Prix was met with much anticipation, most left Saturday’s “Strikeforce: Overeem vs. Werdum” show feeling a severe sense of blah. 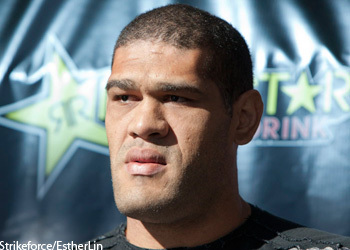 The fans inside the American Airlines Center in Dallas, Texas voiced their displeasure on multiple occasions throughout the evening, Alistair Overeem also expressed displeasure in Fabricio Werdum’s performance, and now it appears Antonio “Bigfoot” Silva wasn’t too impressed while watching Ubereem post a unanimous decision win from the front row. “I actually feel Overeem respected Werdum a lot and he didn’t do as much as he could, but I expected more,” Silva shared at the post-fight presser. “I didn’t see too much. Overeem and Silva now have a date in the semifinals of Strikeforce’s HWGP tourney.